Like many Americans born in the 70s and 80s, my introduction to the sport of soccer was playing on youth recreation league teams in primary school. Growing up in rural Eastern Oregon, exposure to soccer at any professional level was very limited. The North American Soccer League had folded by the time I was 10 and I can’t recall knowing anyone who followed European or Latin American leagues. When the US Men’s team qualified for its first Wold Cup in 40 years in 1990 and then hosted the tournament in 1994, my mind was blown. How could this playground game used as filler between basketball and baseball seasons be so popular everywhere except the US? My international soccer education continued during my employment at Intel. Working alongside people from all over the world, it was a common sight to see fellow employees gathered around televisions in the cafés and break rooms on campus watching their favorite teams. During important World Cup matches these crowds often grew to standing-room only and office productivity ground to a halt in 90-minute increments. I realize most of the world calls this sport “football” and over the years I’ve slowly transitioned my own vocabulary to a more British vernacular: “pitch” instead of “field”, “kit” instead of “uniform”, “table” instead of “standings.” You get my point. When researching the etymology of the word “soccer,” I was shocked to find that it is actually a British English word originating from a strange Oxford abbreviation of “association football player” and was considered just as proper as “football” in the UK until the 70s or 80s when it fell out of favor for being too American. For the opening games of the group stage, Fara and I were traveling through Serbia and Bosnia on our way to Croatia. Everywhere we stopped, bars and cafés had prepared for the tournament by installing extra televisions so patrons could watch a game while enjoying their afternoon beverage. Occasionally we would find large projection screens erected in city parks for public viewing of key games. Since the US was missing from the tournament, I decided to adopt the two local representatives Serbia and Croatia as my teams to root for. For both matches (Croatia vs Nigeria and Costa Rica vs Serbia), we were in Tuzla, Bosnia. At first I was a little worried about openly supporting either team given what little I knew of the recent history between the three countries. What I found was that Bosnian support of their neighboring rivals was almost as strong as it would be of their own team. Upon arrival in Zagreb, Fara immediately got us plugged into the local ex-pat community. 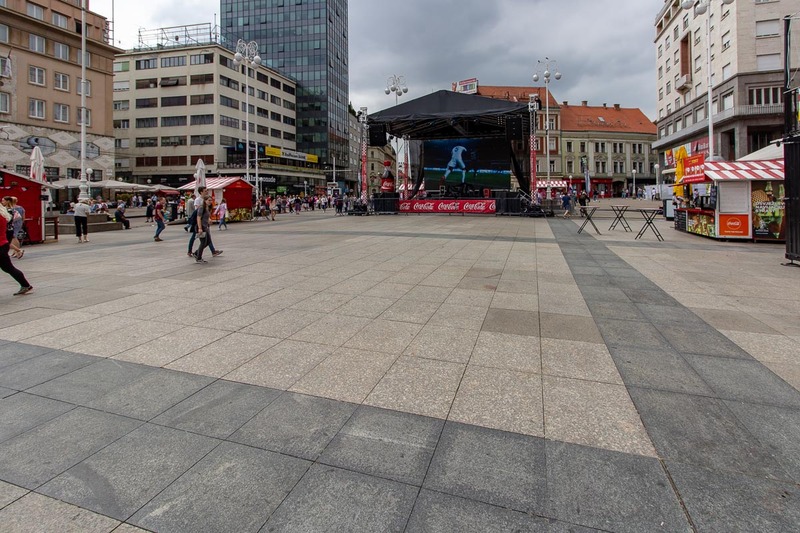 One of the first events we attended was to watch the Croatia vs Argentina game at Ban Jelačić Square in the center of Zagreb. The scene was much like a rock concert with a stage in front of a giant projection screen, a beer garden, multiple food vendors and a few thousand fans decked out in red and white checkered jerseys, scarves, and water polo caps. With each goal in the surprise 3-0 victory the crowd’s excitement ratcheted up another notch, and at the final whistle was a sea of cheering and singing fans, waving Croatian flags through the smoke from burning road flares the supporters have become infamous for. 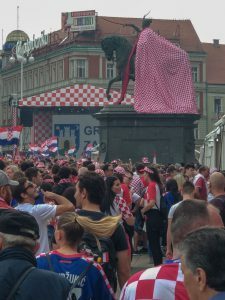 As Croatia went deeper into the tournament, the crowds got larger and more packed, and required fans to arrive earlier and earlier to claim a prime spot in the square. 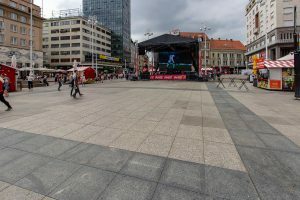 At the semi-final match against England, I walked through the square nearly three hours before the start to find fans already camped out in front of the stage. With each victory, the subsequent celebrations also grew in size and duration, lasting late into the night and the next morning. It wasn’t just the Croatian fans that made an impression over the course of the World Cup. We met a fellow traveler from Mexico while in Sofia, Bulgaria the week prior to the tournament. She had stopped there for a few days before continuing to Russia to follow the Mexican team for as long as they were in the tournament. On an island hopping tour off the coast of Croatia, we stopped for a few hours at the island of Hvar. As our boat landed, we noticed a steady stream of people in Brazilian jerseys heading toward a bar across the harbor. Intrigued, we followed and found a raucous group of over a hundred fans in green and yellow watching the knockout stage match against Mexico. The enthusiasm on display was intense despite the match having just started. The group of ex-pats we’ve befriended while in Zagreb hail from many different countries, many of which are also competing in the World Cup. They are not only supporting their home teams, but have adopted the Croatian side as well. The notable exception are a group of French ex-pats who have understandably decided to side with Les Bleus for the final. We arrived about two hours before the start of the match to a crowd already larger than we had seen for any of the previous games. It had been raining all morning, but few were deterred. 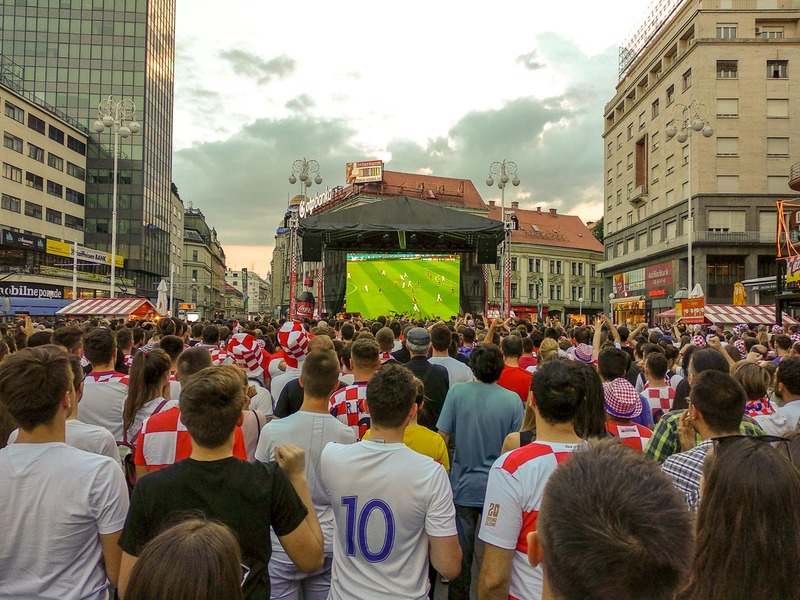 Estimates given by the local media was that hundreds of thousands of fans had packed into a few block radius of the main square by the opening kick. In the end, France was victorious, defeating Croatia with a final score of 4-2. The crowd, going through a roller coaster of emotions, stayed positive and supportive of their team even when it was obvious the deficit was more than could be overcome. We walked around the city in the hours following the medal ceremony and saw fans continue to celebrate despite it being for a second place finish. 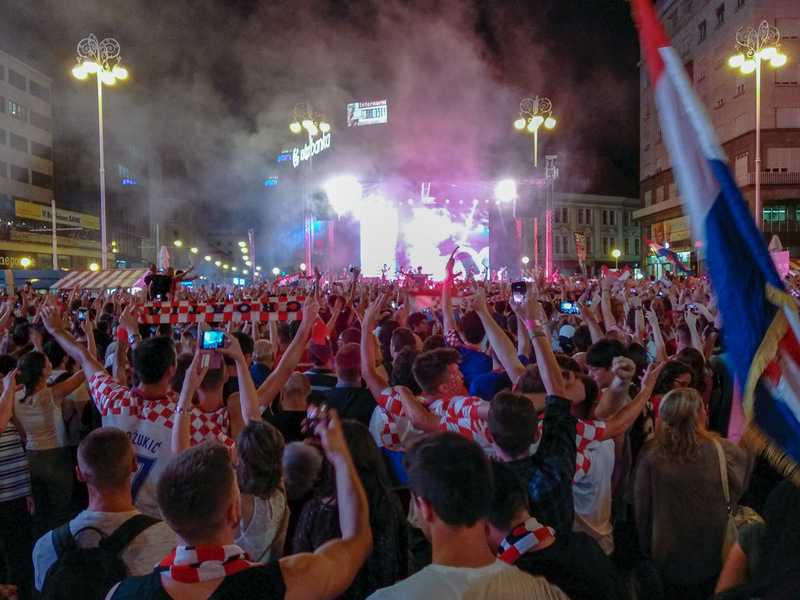 The next day, the team arrived home to a heroes welcome and parade through Zagreb ending at a rally in their honor. The level of national pride we’ve witnessed during the World Cup by the Croatian people has been amazing. 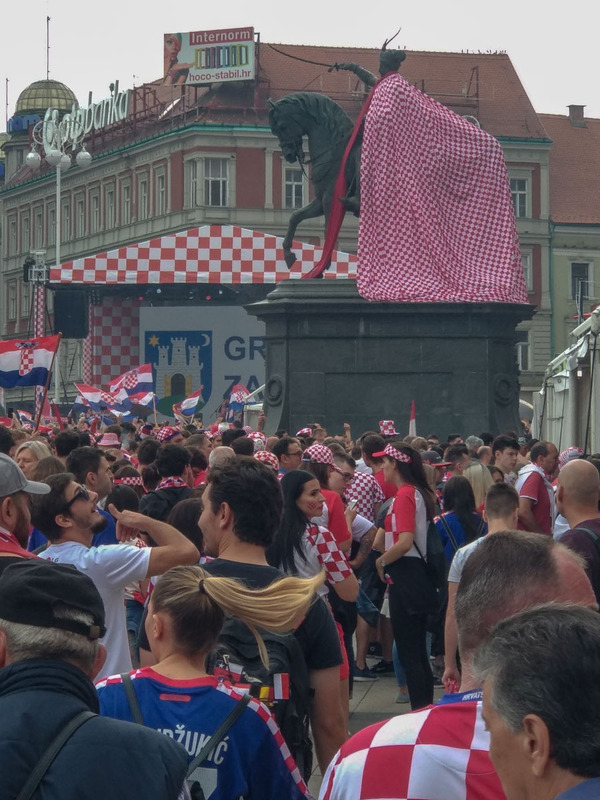 Fara and I have been extremely fortunate to be in Zagreb during Croatia’s run to the World Cup final, it is an experience that has been a highlight of our adventure.